September 26, 2017. San Juan, Commonwealth of Puerto Rico. 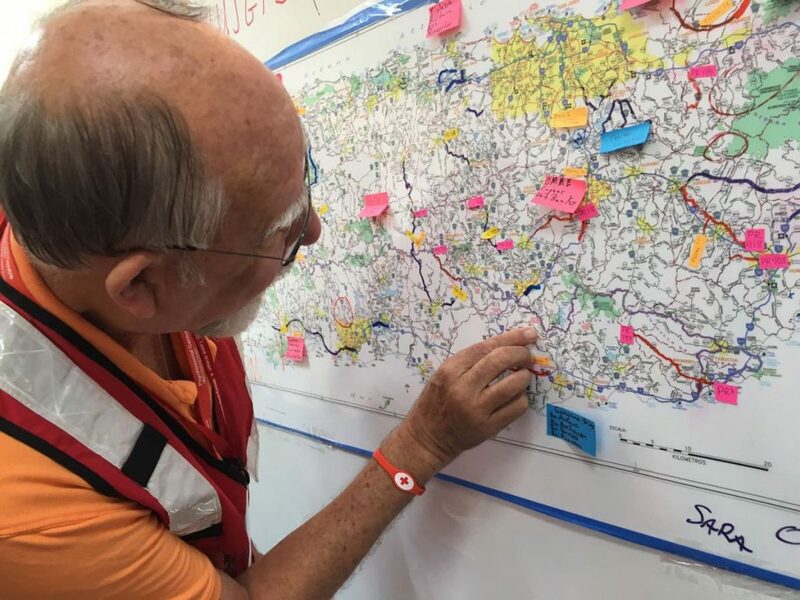 A Red Cross relief worker checks a map of Puerto Rico during aid distribution planning. Photo by Colin Chaperon for the American Red Cross. TWB set up rapid response teams in Spanish, Haitian Creole, Vietnamese, Portuguese and French. They translated 10,000 words initially for Humanity Road and then for another nonprofit, and supported messaging in Arabic, Spanish and Vietnamese. Translations for Texas consisted of basic preparedness materials. TWB provided 13 translators to support social media monitoring for the Humanity Road response, which brought together a number of partners, including the Digital Humanitarian Network, Standby Task Force, Health Care Ready, Americares, Help Earth Foundation, FEMA NBEOC, the US Army National Guard, the US Coast Guard, Northcom, Arizona State University and Texas State University. TWB again maintained rapid response teams for Spanish, Haitian Creole, Vietnamese, Portuguese and French, consisting of 116 volunteers in all. They translated materials for a large national nonprofit and local responders. TWB also did a lot of social media work in the form of storm preparedness messages in French, Spanish and Haitian Creole for the national societies’ international rescue committee (#irc) Twitter accounts. Additionally, TWB translated guidance on shelter management into Spanish for Mexican Red Cross teams, “which we hope will have been of help in their own earthquake response as well,” says Kemp. Because the language of the responders was the same as the language of the affected people, TWB did not set up rapid response teams for these hurricanes. Between September 5-20, the rapid response teams were going in all of the above languages 24 hours a day, seven days a week. Currently, one nonprofit is negotiating an amendment to its existing partnership agreement with TWB for some additional Spanish/English support to response coordination in the aftermath of the storms.